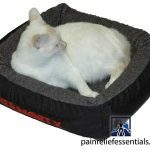 View cart “Thermotex Pet Bed – Small” has been added to your cart. The Thermotex™ Therapeutic Therapeutic Neck appliance is a two element wrap that is designed to provide three element positions on each side of the neck. 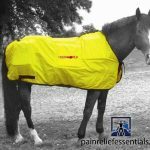 It is built with the same washable and tear-resistant material as the therapy blanket and is secured with three broad Velcro straps that allow application to even the largest of horses. The three positions within the wrap for the placement of the heating elements makes this a unique infrared heating appliance. The top position allows the deep penetrating infrared heat to be applied directly over the dorsal musculature and nuchal ligament. At the base of the skull, this top position is directly over the first few cervical vertebrae. The lower positions allow the direct application of infrared therapeutic heat to the cervical spine and the main musculature of the neck. The heating elements within this appliance can be applied to other anotomical areas as well. Proper positioning of the wrap allows infrared heat treatment to the upper throat area and even over the anatomical areas surrounding the jugular veins. 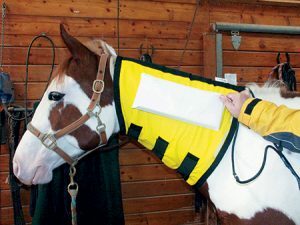 This wrap can be attached to the therapy blanket for the application of heat to the chest area. Individually traumatized areas can easily be treated with this two-element wrap. Vasodilatation and an increase in circulation throughout all of the heated tissues. Increased extensibility within all of the tendons and ligaments. To achieve these desired physiological effects, the neck appliance must be applied properly and often enough to achieve the desired results. The application of infrared therapeutic heat to the neck area should be long in duration – at least 30 minutes with treatment times of 45 – 60 minutes even being better. This appliance is very safe and will not burn or dehydrate the animal. Because we have this product shipped to you directly from the manufacturer, we are able to save on inventory costs and offer the lowest price available including shipping and handling. The package of leggings is shipped to you direct from Alberta, Canada, by DHL Air. For delivery in the United States your package will normally arrive within 2 to 3 business days. How Does the Infrared Heat Therapeutic Neck Work? The advanced technology utilized by Thermotex™ Equine Therapy Systems delivers a relaxing and deep, penetrating heat right where it is needed most. 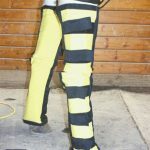 Using infrared therapy in the horse leggings increases hemoglobin 25% to 28%, helps relieve sore muscle and pain from arthritis. The following physiological effects are the result of the application of infrared therapeutic heat. See the additional information tab for product care and step-by-step usage procedure. By using the Thermotex leggings prior to exercising or an event, the animals tendons and ligaments within the limb are more extensible which allows a greater range of motion. A pre-event warm-up with the neck appliance is ideal for dressage horses. In fact, Pleasure horses, Hunters, Jumpers, Eventers, Endurance horses and especially Dressage athletes all will benefit by a pre-exercise/pre-event warm-up with the Thermotex Infrared Therapy System neck appliance. For Pre-event warm up start with the heating elements in the highest position: 10 – 15 minutes on the high setting and another 10 minutes on low. With the heating elements in the middle position: 10 minutes on the high setting and then 10 minutes on low. With the heating elements placed in the lowest position: 10 minutes on high and 10 minutes on low. After completion of this therapy session, it would be ideal to provide a massage session that would conclude with a series of neck stretches. 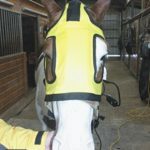 All equine athletes would benefit from an infrared therapy session to their neck regardless of their specific discipline. Due to the unique technology employed by the Thermotex Therapeutic Neck, overheating of the tissues in the legs will not occur. Note that if a clinical problem exists, you should procure an accurate diagnosis before beginning treatment. If the injury has happened within only a few hours then infrared therapy is not recommended. Sorry, the Thermotex Therapeutic Neck is not eligible for discount coupons. Thermotex Equine products ship to you directly by air from the manufacturer and may not arrive in the same package or at the same time as other products you order from Pain Relief Essentials. NOTE: For hygienic and health reasons used equine and pet products are not returnable. 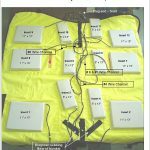 Study on using Thermotex Infrared Equine Therapy vs. conventional heating pads and hot towel for racehorses. All systems come with covers featuring adjustable Velcro fasteners and are machine washable. Covers are 100% nylon with a polyurethane coating. All systems also come with HI/LOW power settings. The infrared pads themselves are not washable or flexible, therefore should never be washed or bent. Easy Step-By-Step Procedure For Use: 1. The animal should be in cross-ties and be clean. All neck sweats or liniments should be removed before applying the neck appliance. Plug in the Thermotex Infrared Therapy System Neck appliance and set to the high setting for a few minutes before placing on the patient. 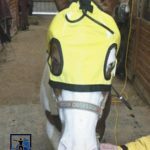 Place the appliance on the neck of the animal, secure in place with the Velcro straps and position the heating elements where desired. Turn the neck appliance on the high setting for the first 10 – 15 minutes of therapy. Then turn the setting to low for the remainder of the therapy session. Make sure all of the electric cords are out of the reach of the animal during the entire therapy session. When the therapy is concluded, wipe the inside of the wrap with a mild disinfectant, dray and store in a clean place.